We present a blink-spot projection method for observing moving three-dimensional (3D) scenes. The proposed method can reduce the synchronization errors of the sequential structured light illumination, which are caused by multiple light patterns projected with different timings when fast-moving objects are observed. In our method, a series of spot array patterns, whose spot sizes change at different timings corresponding to their identification (ID) number, is projected onto scenes to be measured by a high-speed projector. Based on simultaneous and robust frame-to-frame tracking of the projected spots using their ID numbers, the 3D shape of the measuring scene can be obtained without misalignments, even when there are fast movements in the camera view. We implemented our method with a high-frame-rate projector-camera system that can process 512 × 512 pixel images in real-time at 500 fps to track and recognize 16 × 16 spots in the images. Its effectiveness was demonstrated through several 3D shape measurements when the 3D module was mounted on a fast-moving six-degrees-of-freedom manipulator. J. Chen, Q. Gu, T. Aoyama, T. Takaki, and I. Ishii, “Blink-Spot Projection Method for Fast Three-Dimensional Shape Measurement,” J. Robot. Mechatron., Vol.27, No.4, pp. 430-443, 2015. D. Kobayashi, T. Takubo, and A. Ueno, “Model-Based Footstep Planning Method for Biped Walking on 3D Field,” J. of Robotics and Mechatronics, Vol.27, No.2, pp. 156-166, 2015. S. Akizuki and M. Hashimoto, “Stable Position and Pose Estimation of Industrial Parts Using Evaluation of Observability of 3D Vector Pairs,” J. of Robotics and Mechatronics, Vol.27, No.2, pp. 174-181, 2015. J. 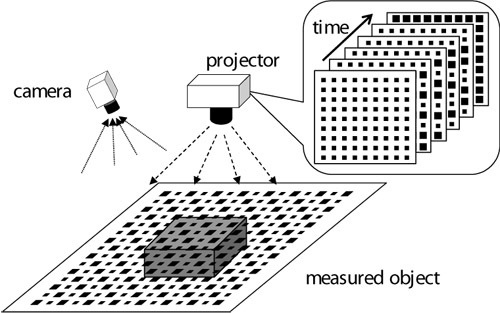 Pages, J. Salvi, R. Garcia, and C. Matabosch, “Overview of coded light projection techniques for automatic 3D profiling,” IEEE Int. Conf. on Robotics and Automation, pp. 133-138, 2003. S. Zhang, “Recent progresses on real-time 3D shape measurement using digital fringe projection techniques,” Optics and lasers in engineering, Vol.48, No.2, pp. 149-158, 2010. G. Geng, “Structured-light 3D surface imaging: a tutorial,” Advances in Optics and Photonics, Vol.3, No.2, pp. 128-160, 2011. M. Morita, T. Saito, S. Kurihara, and K. Kohiyama, “A Design and Implementation of 3D Scanning System Using a Slit Lighting,” Imaging & Visual Computing The J. of the Institute of Image Electronics Engineers of Japan, Vol.33, No.4B, pp. 555-564, 2004. F. Forster, “A high-resolution and high accuracy real-time 3D sensor based on structured light,” Int. Symposium on 3D Data Processing, Visualization, and Transmission, pp. 208-215, 2006. H. Nguyen, D. Nguyen, Z. Wang, H. Kieu, and M. Le, “Real-Time, High-Accuracy 3D Imaging and Shape Measurement,” Applied Optics, Vol.54, No.1, pp. A9-A17, 2015. B. Huang and Y. Tang, “Fast 3D Reconstruction using One-shot Spatial Structured Light,” IEEE Int. Conf. on Systems, Man, and Cybernetics, pp. 531-536, 2014. Y. Zhang, Z. Xiong, Z. Yang, and F. Wu, “Real-Time Scalable Depth Sensing with Hybrid Structured Light Illumination,” IEEE Trans. on image processing, Vol.23, No.1, pp. 97-109, 2014. Q. Gu, T. Takaki, and I. Ishii, “Fast FPGA-based multi-object feature extraction,” IEEE Trans. Circuits and Systems for Video Technology, Vol.23, No.1, pp. 30-45, 2013. Q. Gu, T. Takaki, and I. Ishii, “A fast multi-object extraction algorithm based on cell-based connected components labeling,” IEICE Trans. Information and Systems, Vol.E95-D, No.2, pp. 636-645, 2012. X. Su and Q. Zhang, “Dynamic 3-D shape measurement method: A review,” Optics and Lasers in Engineering, Vol.48, No.2, pp. 191-204, 2010. J. Davis, R. Ramamoothi, and S. Rusinkiewicz, “Spacetime stereo: A unifying framework for depth from triangulation,” IEEE Trans. on Pattern Analysis and Machine Intelligence (PAMI), Vol.27, No.2, pp. 296-302, 2005. S. Yamazaki, A. Nukada, and M. Mochimaru, “Hamming Color Code for Dense and Robust One-shot 3D Scanning,” The British Machine Vision Conf. (BMVC), pp. 96.1-96.9, 2011. A. Osman Ulusoy, F. Calakli, and G. Taubin, “One-shot scanning using De Bruijn spaced grids,” IEEE 12th Int. Conf. on Computer Vision Workshops (ICCV Workshops), pp. 1786-1792, 2009. H. Kawasaki, R. Furukawa, R. Sagawa, and Y. Yagi, “Dynamic scene shape reconstruction using a single structured light pattern,” IEEE Conf. on Computer Vision and Pattern Recognition (CVPR), pp. 1-8, 2008. R. Sagawa, H. Kawasaki, S. Kiyota, and R. Furukawa, “Dense one-shot 3d reconstruction by detecting continuous regions with parallel line projection,” IEEE Int. Conf. on Computer Vision (ICCV), pp. 1911-1918, 2011. K. Nakazawa and C. Suzuki, “Development of 3-D robot vision sensor with fiber grating: Fusion of 2-D intensity image and discrete range image,” Int. Conf. on Industrial Electronics, Control and Instrumentation, pp. 2368-2372, 1991. K. Umeda, “A compact range image sensor suitable for robots,” IEEE Int. Conf. on Robotics and Automation (ICRA), pp. 3167-3172, 2004. Y. Watanabe, T. Komura, and M. Ishikawa, “955-fps real-time shape measurement of a moving/deforming object using high-speed vision for numerous-point analysis,” IEEE Int. Conf. on Robotics and Automation (ICRA), pp. 3192-3197, 2007. S. Inokuchi, K. Sato, and F. Matsuda, “Range imaging system for 3-D object recognition,” Int. Conf. on Pattern Recognition, pp. 806-808, 1984. S. S. Gorthi and P. Rastogi, “Fringe Projection Techniques: Whither we are?,” Optics and Lasers in Engineering, Vol.48, No.2, pp. 133-140, 2010. M. Kumagai, “Development of a 3D Vision Range Sensor Using Equiphase Light Section Method,” J. of Robotics and Mechatronics, Vol.17, No.2, pp. 110-115, 2005. H. Gao, T. Takaki, and I. Ishii, “GPU-based real-time structure light 3D scanner at 500 fps,” in SPIE 8437 (SPIE Photonics Europe / Real-Time Image and Video Processing), pp. 8437-18, 2012. J. Chen, T. Yamamoto, T. Aoyama, T. Takaki, and I. Ishii, “Simultaneous Projection Mapping Using High-frame-rate Depth Vision,” IEEE Int. Conf. on Robotics and Automation (ICRA), pp. 4506-4511, 2014. Y. Liu, H. Gao, Q. Gu, T. Aoyama, T. Takaki, and I. Ishii, “High-Frame-Rate Structured Light 3-D Vision for Fast Moving Objects,” J. of Robotics and Mechatronics, Vol.26, No.3, pp. 311-320, 2014. Y. Zhang, Z. Xiong, and F. Wu, “Unambiguous 3D measurement from speckle-embedded fringe,” Applied Optics, Vol.52, No.32, pp. 7797-7805, 2013. S. Zhang, D. Van Der Weide, and J. Oliver, “Superfast phase-shifting method for 3-D shape measurement,” Optics express, Vol.18, No.9, pp. 9684-9689, 2010. Y. Wang, K. Liu, Q. Hao, D. L. Lau, and L. G. Hassebrook, “Period coded phase shifting strategy for real-time 3-D structured light illumination,” IEEE Trans. Image Process, Vol.20, No.11, pp. 3001-3013, 2011. S. Zhang, X. Li, and S. Yau, “Multilevel quality-guided phase unwrapping algorithm for real-time three-dimensional shape reconstruction,” Applied Optics, Vol.46, No.1, pp. 50-57, 2007. L. Zhang, B. Curless, and S. Seitz, “Spacetime stereo: Shape recovery for dynamic scenes,” IEEE Conf. on Computer Vision and Pattern Recognition (CVPR), pp. 367-374, 2003. O. Hall-Holt and S. Rusinkiewicz, “Stripe boundary codes for real-time structured-light range scanning of moving objects,” IEEE Int. Conf. on Computer Vision (ICCV), pp. 359-366, 2001. L. Zhang, B. Curless, and S. Seitz, “Rapid Shape Acquisition Using Color Structured Light and Multi-pass Dynamic Programming,” Proc. of the 1st Int. Symposium on 3D Data Processing, Visualization, and Transmission (3DPVT), pp. 24-36, 2002. T. Weise, B. Leibe, and L. Van Gool, “Fast 3d scanning with automatic motion compensation,” IEEE Conf. on Computer Vision and Pattern Recognition, pp. 1-8, 2007. I. Ishii, T. Tatebe, Q. Gu, Y. Moriue, T. Takaki, and K. Tajima, “2000 fps real-time vision system with high-frame-rate video recording,” IEEE Int. Conf. on Robotics and Automation (ICRA), pp. 1536-1541, 2010. J. Chen, Y. Liu, Q. Gu, T. Aoyama, T. Takaki, and I. Ishii, “Robot-mounted 500-fps 3-D Shape Measurement Using Motion-compensated Coded Structured Light Method,” IEEE Int. Conf. on Robotics and Biomimetics (ROBIO), pp. 1989-1994, 2014.